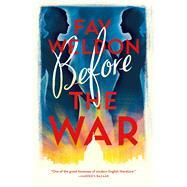 Fay Weldon, with one eye on the present and one on the past, offers Vivien’s fate, along with that of London between World War I and World War II. This is a city fizzing with change, full of flat-chested flappers, shell-shocked soldiers, and aristocrats clinging onto the past. Inventive, warm, playful, and full of Weldon’s trademark ironic edge, Before the War is a spellbinding novel from one of the best writers of our time. FAY WELDON is a novelist, playwright, and screenwriter. In addition to winning a Writers’ Guild Award for the pilot of Upstairs Downstairs, she is a Commander of the British Empire whose books include Praxis, shortlisted for the Booker Prize for Fiction; The Heart of the Country, winner of the Los Angeles Times Fiction Prize; Worst Fears, shortlisted for the Whitbread Novel Award; and Wicked Women, which won the PEN/Macmillan Silver Pen Award. She lives in England.